What's new is new again. 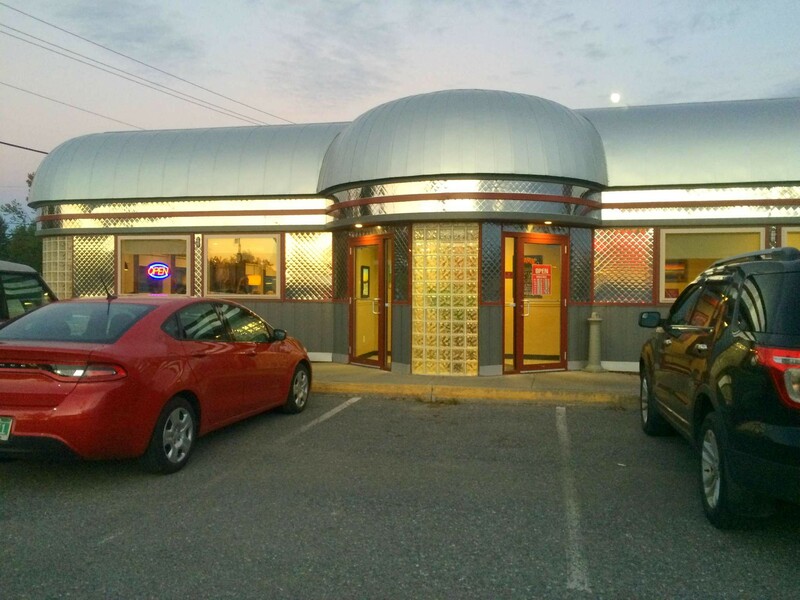 It was only five years ago that I first described entering "the gleaming embrace" of Milton's newly built Apollo Diner. But the Greek joint closed in January. Now, a similarly old-fashioned concept fills the still-glistening silver building. Rowan's debuted at the end of May, pushing burgers and hand-turned shakes. And the food is resolutely old-school. But I don't mean the from-scratch creations your grandmother labored over after church. I'm thinking more along the lines of the handiwork of Mr. Stouffer. More on that later. First, the shakes. The thick concoctions are hand turned to order and available in 12 flavors, not including daily specials. My chocolate-covered strawberry shake was hard to drink with big chunks of strawberry sticking in my straw, but I didn't mind. I just overturned my straw and kept at it. The chocolate flavor could have been richer, but who was I to complain when I had a giant glass and a metal cup filled with what didn't fit in the first pour? The toasted marshmallow flavor was even better, unabashedly fake but gloriously sugary. But things went downhill from there. Looking at the picture above, it's not hard to see the TV dinner comparison, or why my dining partner referred to our meal as a "dinner by Reinhardt." 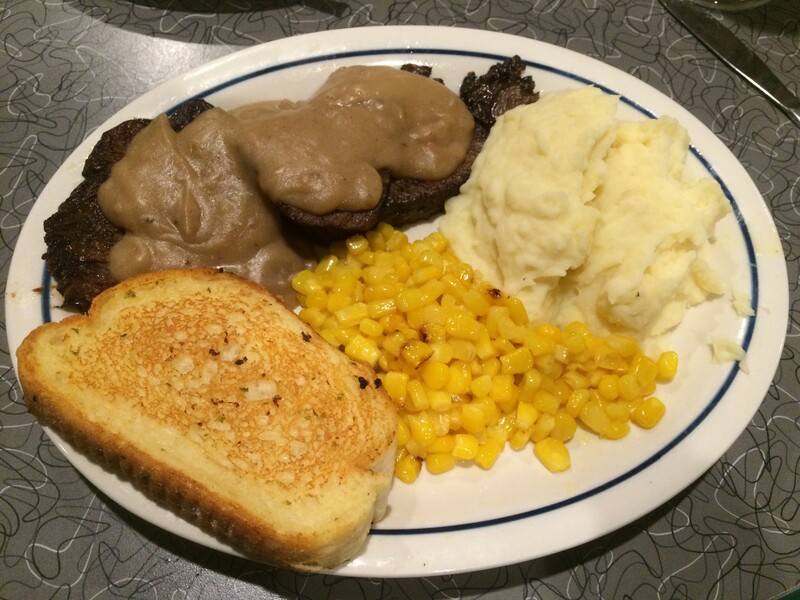 There was comfort in the buttery, garlicky Texas toast, the creamy mashed potatoes and the obviously canned corn, but there wasn't much to love about the greasy slivers of pot roast drowned in gloppy gravy. Pre-fab isn't always a bad thing, though. 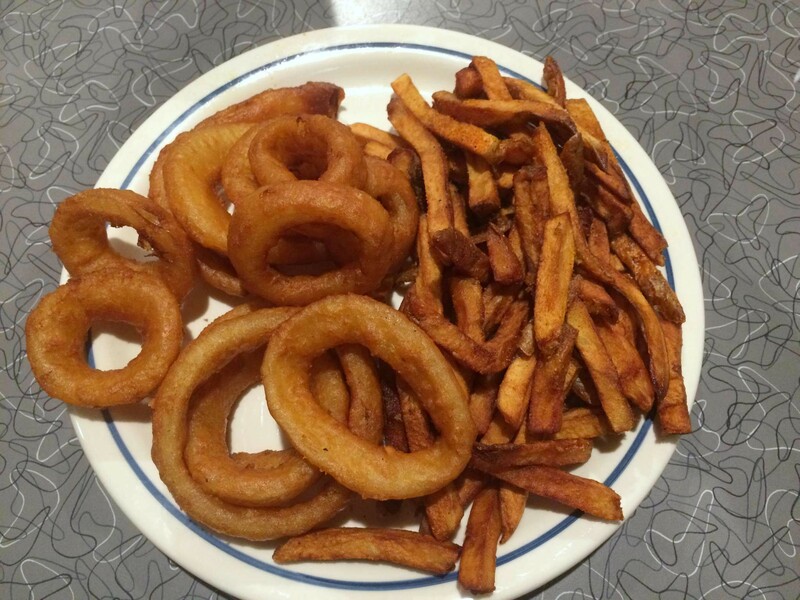 The beer-battered onion rings had a nice whiff of booze, despite being too perfectly formed not to have been manufactured and frozen. I liked them better than the fries that were cut in-house. Though the latter were uniform in size and shape, their doneness was less so. Some were crisp, others were floppy, and all tasted ever so slightly burnt. Naturally, I ordered the most excessive of the menu's 10 burgers. The Vermont maple burger looked like a doozy, with a steak knife stabbing through it to further prove its badassitude. 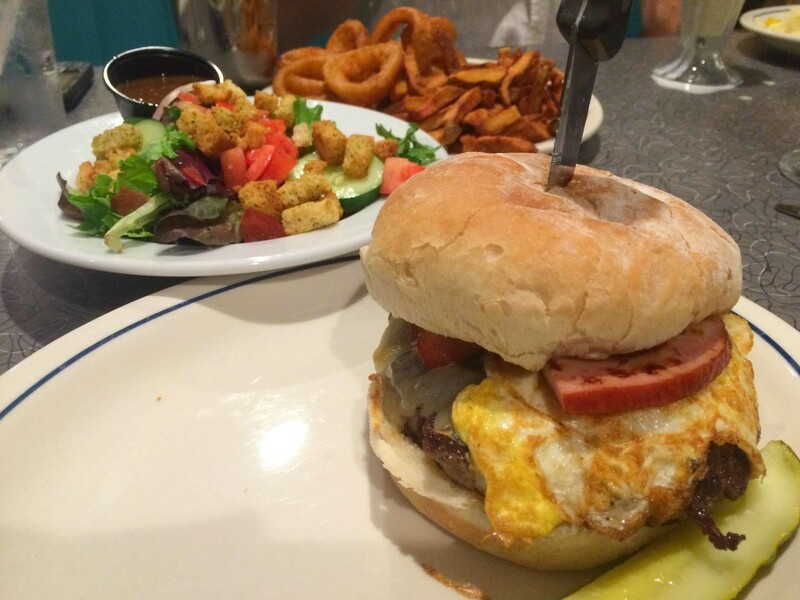 The burger reminded me of the ones my mother made me as a kid — but she's a vegetarian. The patty I had ordered medium-rare came to me unseasoned and cooked to a uniform gray. But the bigger surprise was that even what I had imagined as a dual-pronged assault of salty pork — a slab of ham and some rashers of bacon — didn't add much to the overall impact. The fried egg draped over the top added a fun dash of texture, and a layer of cheddar helped the elements stick together. But the whole burger had a strangely homogenous, mild taste except for the bites blessed with a drizzle of maple syrup. The size of the side salad, pictured behind the burger above, was good. I ordered the sole homemade dressing, a nicely balanced honey-balsamic vinaigrette, but the fresh greens almost didn't need it. Pity about the hard, factory-made croutons. As much as I admire the concept of a burger-and-shake shack in Milton's most interesting building, I left feeling like I could have eaten that meal anywhere. More homemade elements would give the food not only more personality but a taste of place. 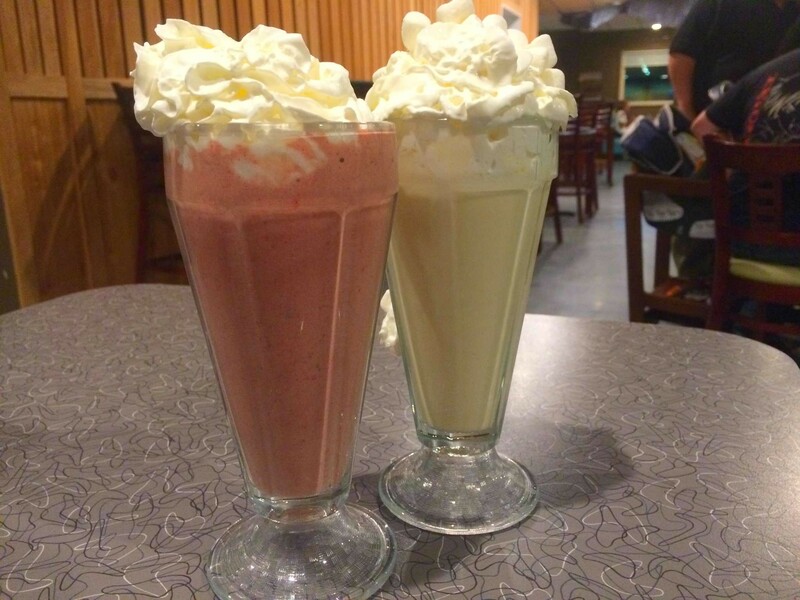 Until that happens, stick to the shakes.